Upcoming FINRA exam changes for 2015 & 2016. Solomon Exam Prep is pleased announce a joint venture with University of California, Berkeley: SIE Exam Bootcamp! This intensive, four-day, live class will prepare you for a career in the securities industry! Starting October 1st, passing the SIE will be the first step to getting licensed in the securities industry. If you want to get ahead of the curve, or if you need a better grasp of the basics of securities and the markets, the SIE exam course will be a thorough and valuable introduction. Students will also be provided with comprehensive study materials from Solomon Exam Prep and continued tutoring options upon completion of the SIE Exam Bootcamp. How Can I Take The Class? 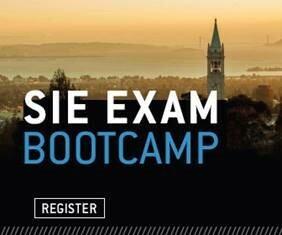 The UC Berkeley SIE Exam Bootcamp will take place August 6-9 on the UC Berkeley campus. Alert! 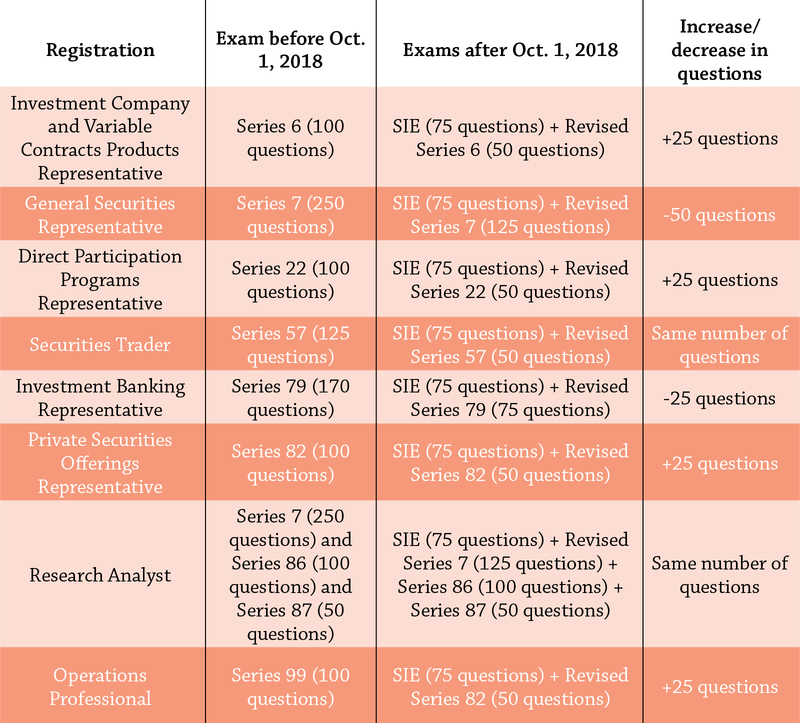 Starting October 1, the number of exam questions for the Series 82 Private Securities Offerings Representative licensing category will increase from 100 questions to 125 questions. That’s because starting October 1, the Series 82 exam, like all FINRA representative level exams, is being divided into two exams: the SIE (75 questions) and the Series 82 “top-off” (50 questions). More work! But if you don’t want to take 25 additional questions, not to mention take two exams instead of one, then Solomon Exam Prep recommends you take your Series 82 exam pronto, before October 1. Series 82 students will also be happy to know that Solomon Exam Prep has just updated its Series 82 Video Lecture with updates about Regulation D, Rule 147, and research report rules. The Solomon Exam Prep Video Lecture is a critical piece of the Solomon Securities Exam Prep system that also includes the Exam Guide, the Audio Guide and the Exam Simulator. Spring is in the air and there has never been a better time to take the Series 82! Today FINRA released the final Securities Industry Essentials (SIE) exam content outline. The outline is an updated version of the draft that FINRA released as part of an earlier regulatory notice. This final content outline is now available on the FINRA website. With the release of the SIE content outline, content outlines for the revised representative level (“top-off”) exams — the Series 6, Series 7, Series 22, Series 57 Series 79, Series 82, Series 86/87, and Series 99 — are expected to follow. While FINRA has proposed a $60 fee for the SIE exam, it has yet to determine a passing score. The SIE is expected to launch October 1. For more information about the SIE or other FINRA, NASAA or MSRB securities licensing exams, visit www.solomonexamprep.com or give us a call at 503-601-0212. On December 20, 2017, FINRA held its Board of Governors Meeting to discuss rule proposals and the 2018 budget. One rule that was addressed was the fee for the Securities Industry Essentials (SIE) exam. FINRA chose a fee of $60 for the exam. This rule change will be filed with the SEC and await approval sometime in the new year. The $60 fee is considerably less than the $100 fee for the Series 6 and the $305 fee for the Series 7 exam. FINRA’s meeting notes report that the price for other exams will be reevaluated as well, to adhere to the changing securities landscape. FINRA is giving the securities industry a facelift. In an effort to reduce redundant exams and to attract more people to the industry, FINRA has ordered a nip and tuck of its licensing exams. Starting October 1, 2018 FINRA’s makeover will come most obviously in the form of the new Securities Industry Essentials (SIE) exam. The 75-question SIE will test basic securities industry knowledge including products, the structure and function of the securities industry, the regulatory agencies and their functions, and regulated and prohibited practices. FINRA’s facelift isn’t just skin deep. It’s a complete overhaul of the current representative exam structure. After slicing back layers of the old system to make room for the new SIE exam, FINRA determined that it needed to eliminate seven of the 16 representative level registration categories. The remaining nine representative exams – Series 6, Series 7, Series 22, Series 57, Series 79, Series 82, Series 86/87 and Series 99 — will become specialized knowledge exams focused on a particular registration category; FINRA is calling these nine “top off” exams. Sponsored applicants will be permitted to sit for the top-off exams after passing the SIE and landing a job in the industry. Unlike every FINRA exam before it, the new SIE exam will not require sponsorship. This means that anyone aged 18 or older who wants to take the SIE exam will be permitted to sit for it. A job with a FINRA member firm will not be required. Passing the SIE will be valid for four years. Solomon Exam Prep, known for its industry-leading test prep materials and high pass rates, just released SIE study materials for firms wishing to get a head start on their SIE programs. The SIE won’t just help FINRA recruit more people; it will also help firms grow their network by offering candidates an early and powerful educational knowledge base. For firms wishing to stay ahead, providing an early opportunity to study for the SIE exam will put them miles ahead of firms that wait. Bob Morris, Chief Compliance Officer for Sussex Securities, agreed that the SIE will change the industry. Morris argued that the change is for the better. Mr. Solomon elaborated that preparing for the SIE exam now is a great way to develop a thorough understanding of the securities industry. Solomon Exam Prep is popular amongst securities professionals for many reasons. One of those reasons is the way the materials are written, breaking down complex topics into laymen’s terms. Linde Murphy, Chief Operating Officer at M.E. Allison & Co., Inc., vouched for Solomon Exam Prep. Ms. Murphy explained that the SIE exam will allow more people to enter the securities industry. But she added that studying for the SIE is going to be a challenge, as with any licensing exam. Mr. Morris used Solomon Exam prep to pass several licensing exams. Mr. Morris explained how taking licensing exams is difficult without proper study materials. “I dread taking exams. And some of the [licensing] exams are very stressful. It is all about preparation.” Mr. Morris said. Mr. Morris explained that, for him, that preparation included Solomon Exam Prep. Dante Fichera, President of Independent Investment Bankers, reiterated Morris’ endorsement of Solomon Exam Prep. Mr. Fichera’s candidates must pass FINRA’s Investment Banking Representative Qualification Exam (Series 79) and the Uniform Securities Agent State Law Exam (Series 63). The SIE exam will be an introductory exam, testing students on their knowledge of the securities industry, and will pave the way for students to take specialized top-off exams to further their growth in the industry. Solomon Exam Prep invites you to visit our website. The SIE study materials are available in the popular Essentials Study Package or for individual purchase. Interested in setting up an SIE program? Contact Jeremy Solomon, President, at jeremy@solomonexamprep.com or by calling Solomon Exam Prep at 503-601-0212. Looking to kick start your career? You’ve come to the right place! Many people are aware that FINRA is giving the securities industry a face-lift. Hoping to attract more securities professionals, FINRA is going to release a new exam in 2018. The Securities Industry Essentials (SIE) exam will give the industry a chance to attract some new prospects. In the past, FINRA’s exams were only available to those employed by a broker-dealer and working in the industry. The SIE exam is going to change that. This exam will be available to anyone who wants to take it. While the exam won’t be available until 2018, Solomon Exam Prep remains in front of the competition and released SIE study materials earlier this week. Known for our high pass rates, no-nonsense study guides, and industry-leading exam simulators, we’re excited to unveil our SIE study materials to the public. Check out our SIE exam study guide and online exam simulator here! Don’t wait! Get a head start on your studying and impress your future employers by acing the SIE exam. You’ll thank us later! Our SIE study materials are available in the popular Essentials Package or for individual purchase. UPDATE: The SIE has been approved and October 1st, 2018 is it’s official launch date. Beginning October 2018, according to a FINRA proposal, anyone seeking to enter the securities industry must take FINRA’s Securities Industry Essentials (SIE) exam, which will test applicants’ general knowledge of the securities industry. Applicants will also be required to pass a specialized knowledge exam that is tailored to the applicant’s desired job, if that job is at the representative level. For instance, the specialized Series 79 will allow an applicant to work as an investment banker. These specialized knowledge exams are also known as top-off tests. Unlike with current securities licensing exams, test-takers will not be required to be sponsored by a firm in order to sign up for the Securities Industry Essentials exam. This will mean that even if you don’t have a job at a FINRA member firm, you will be able to take the SIE exam. However, before signing up for a specialized exam, the applicant will need to be sponsored by a FINRA member firm. This new system will allow people with little or no experience in the securities industry to demonstrate their knowledge before applying for securities jobs, and then to pursue a specialized exam after being hired. Once an individual has passed the SIE exam, his scores will remain valid for four years. If an individual does not register with a firm within four years of passing the SIE exam, that individual will be required to retake the exam. The same will be true of an individual who leaves the industry and returns. If he returns within four years, he will not have to retake the SIE exam. However, according to the FINRA proposal, this will only be true of the SIE exam, not any of the specialized exams. Specialized exam results will expire two years after an individual leaves the industry. The SIE exam is part of a larger set of changes that FINRA has proposed that will affect all of the FINRA securities licensing exams. For instance, under the current system, if you are registered with a firm and you transfer to a financial services affiliate (that is, an affiliate that is not regulated by FINRA) and you stay with the affiliate for two years or more, then you must retake all of your securities licensing exams before returning to the FINRA-regulated firm. FINRA’s proposed changes will allow an individual to return to a firm within seven years without having to retake his exams. Once an individual has taken the SIE exam and a specialized exam, if his job changes and he needs to take another specialized exam, he will not need to repeat the SIE exam. This is yet another way in which the new proposal will avoid individuals being tested on the same concepts repeatedly. According to the FINRA proposal, the SIE exam will consist of 75 questions, with an additional 10 questions that will not be scored. That means you can expect to see 85 questions on the actual exam. The 10 unscored questions help FINRA to test out new questions before they are permanently added to the exam database. For more information about the Essentials or any other exam, visit www.solomonexamprep.com or give us a call at 503-601-0212!